Do you know someone who has a broken bone in their arm, hand, or wrist and is wearing a cast? Do they play sports and fear their season may be over? THE CAST PROTECTOR is the answer to their fears. Once the pain from a broken bone subsides, if the sport in question allows it, and the doctor feels it is safe, THE CAST PROTECTOR helps pad the cast, allowing those wearing a cast to play, by providing a professionally made, easy to apply protector for the cast. Whether or not to play sports with a fracture is a decision that must be made carefully. A physician, parent, coach, and player should all participate in and understand the reasoning for the decision, as well as the risks involved. THE CAST PROTECTOR does not decrease the risk of re-injury, it primarily protects other players from contact with a stiff, rough cast. 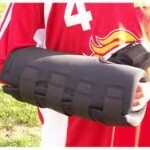 The CAST PROTECTOR is made in the USA and has been approved by the National Federation of State High School Associations.